The Career Services Department at AIHT Education is committed to support and assist all of our students. This is accomplished through a variety of career development activities including career counseling, externship placement, and job search assistance. Our ultimate goal is to prepare every AIHT student for a long, successful career in their chosen field. Having the proper resources to conduct a successful job search can make a big difference. AIHT offers a variety of career resources and tools to its students and graduates. Some of these valuable resources include employer partnerships, job referrals, and career fairs. Locating job opportunities that are the right match for your educational background and specific skill sets can be a challenging process. Luckily we have built up relationships and developed partnerships with a variety of employers in the healthcare field. These relationships allow us to expose our qualified students and alumni to numerous job opportunities. Attending a local or regional career fair is a wonderful opportunity to start networking and meet prospective employers face to face. In addition to hosting job fairs, we can also provide information on other career fairs in the area, including both local and regional events. 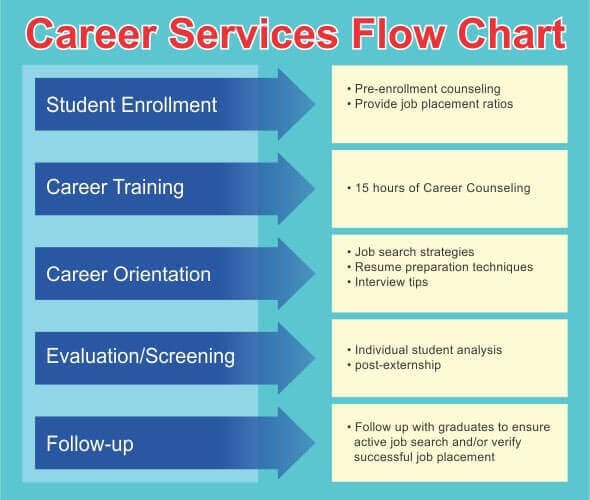 The role of Career Services is not to act as an employment agency. We provide students with the tools, resources and opportunities to find internships, jobs and appropriate advice, but ultimately students are the ones responsible for their “placement” or outcome. AIHT Education is always trying to improve the educational experience for our students. Your feedback is therefore essential to our efforts. ** There are a number of factors that will determine the success of your job search. Potential employers will consider attitude, grades, interview performance, work background, educational background, and other intangible factors when determining employment. AIHT Education can assist students in finding employment, but as an institute of higher education we cannot promise employment.